Dinosaurs and Robots: Super Maniable! I'm going to be the annoying francophile for a while since I'm back in Paris, taking a much-needed break and visiting my niece after a grueling summer of work. That means my subsequent posts (unless my D+R hosts decide to cut me off) will be about all the neat things I'm finding here. It will be Paris this and Paris that, my entries pretentiously peppered with French words and so forth. As my rather difficult ten-year old niece said to me the other day with a wave of her hand, "You'll have to get used to it." 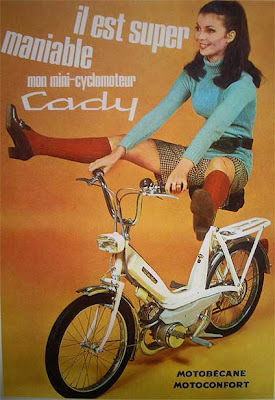 Today's find: this great postcard of a vintage Cady mini-moto-bicycle advertisement with a très jaunty gal (who would no doubt get harassed today in Paris for wearing red knee-high socks).